There are several distinctions between promise rings and engagement rings. Some include the material of the piece — like the size of the stone and the expense — and some are emotional. This month on the blog we’re clearing up the confusion. In short, an engagement ring is a symbol of a promise to wed when a proposal has been accepted. The reasons behind giving or receiving a promise ring vary and are typically known only to the wearer and the giver. What a promise ring symbolizes is personal and unique to the relationship; though, they most often represent love and commitment, serving as a reminder of the other when physically apart. 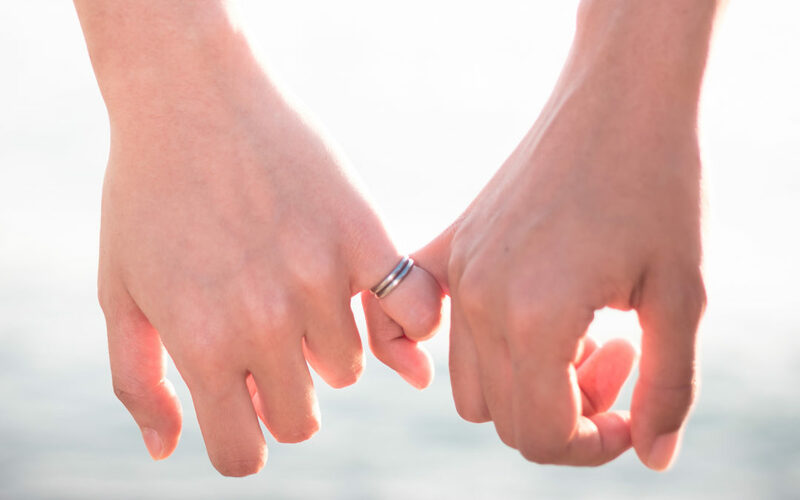 Promise rings have risen in popularity lately as a way to show commitment between couples that may not want to rush things or label their current state. To these people the promise ring represents the sometimes unseen assurance that one intends to further the relationship. If and/or when an engagement ring is given in the future the promise will usually move to the opposite hand, although some prefer a “stacked” look with promise and engagement rings touching. Friends have often exchanged promise rings throughout the times. Best friends exchanging promises as they part ways for the first time, or perhaps a group of friends wanting to remember past times. Sometimes parents give promise rings to their children as a reminder of the everlasting bond and love they have for one another. They really can be worn as a promise of anything. Promise rings are usually of a smaller and more subtle nature than engagement rings, and can be worn on any finger. Diamonds are always popular, but some prefer a cluster of gems or none at all. The metals also typically stray from that of an engagement ring. While 18k gold and platinum are popular among the engagement rings, sterling silver is an affordable option for a promise ring. The most popular design of a promise ring being a custom engraving. A heart felt unique message from the giver that is mostly only seen or known by the wearer. No matter the reason for giving or getting a promise ring, it stands as a classic and beautiful symbol of devotion and commitment to a loved one.